I’ve always had a bit of a soft spot for Swansea City. It stems back to the late Seventies and early Eighties when they had a side that won promotion for three consecutive seasons from the Fourth Division to the then First Division. And for a period in the early part of the season in the top flight, actually lead the league. They did eventually end up finishing in sixth place, but the team that included the likes of Robbie James, John Toshack, Colin Irwin, Bob Latchford and Alan Curtis were a breath of fresh air and certainly put the wind up the old guard. They were relegated the following season and over a number of years the decline was more gradual than the climb, but even so it was stark. Only a last day victory stopped them from dropping into the Conference in 2002. Then they did it all over again, but not quite so quickly! 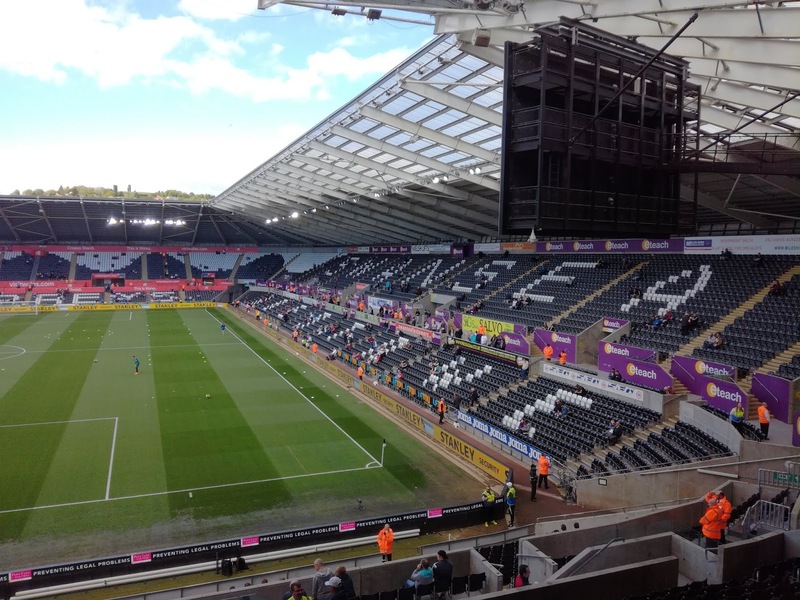 From near oblivion in 2002, they moved from the Vetch Field to the Liberty Stadium in 2005, and by 2011 they were competing in the Premier League. Under Brendan Rogers, and then Michael Laudrup they played some quite beautiful football, ok, it was never going to win the league, but mid-table finishes and a League Cup win, combined with a prolonged run in the Europa League, were just rewards for the sheer brilliance they were serving up. I loved watching them, in fact, I don’t mind admitting that during my forays onto FIFA with young Master Hatt, I more often than not set myself up as Swansea City. 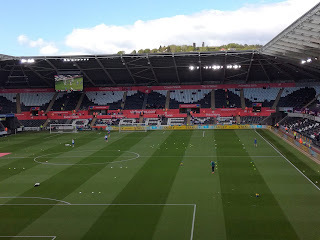 I also loved the atmosphere they created at the Liberty that came through brilliantly on the TV, ‘Hymns & Arias’ when the crowd was in full voice was spine tingling. I’ve only ever been to Swansea once. It would have been around the time the club first got into the Premier League. I was staying overnight in Baglan on a Friday prior to watching a game in Port Talbot that night. I got the train into Swansea and had a wander down to the Marina for a few pints. The Marina was lovely, but the area around the station less so. It was outside the station that I saw the iconic words “Ambition Is Critical” embedded into the concourse. I had assumed they were the poetic words of Dylan Thomas, as backed up by the quite brilliant yet dark film ‘Twin Town’ starring Rhys Ifans, but it appears they weren’t his words at all. Twin Town, now that was a film, if ever a film could showcase all that is both great and bad about a City then that would be it. So many brilliant moments, so very Welsh, but so very, very funny. 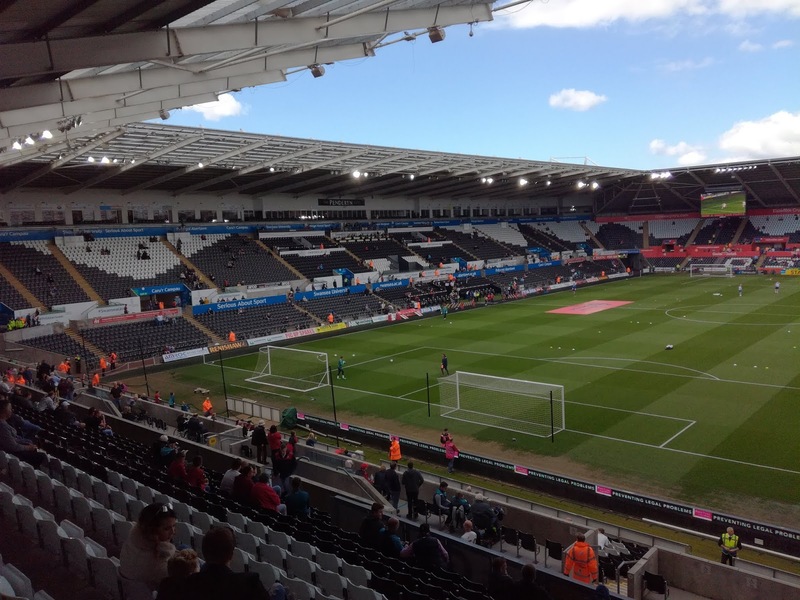 I travelled past the Liberty Stadium that day on the train and did wonder how long it would take before I could get myself down for a game. To be honest, I always thought it would be a really tough gig trying to get tickets, but when they came on sale for what at the time appeared to be a potentially crucial game against Stoke City, I went online and within minutes one was being spat out by my printer. It’s not been a great season for the Swans. Paul Clement had shocking start and was sacked, so in came former Owl Carlos Carvahal who clearly had a new dream! Carlos had a great start and looked like the saviour, but it all went belly up and by the time I was getting in the car for what initially I thought we be a tasty dog-eat-dog survival battle, I was effectively going to a dead rubber because Stoke were doomed and barring a modern day miracle, so were the Swans. The M4 wends its way past Cardiff and Bridgend before arriving at Port Talbot, which again has a certain urban/rural beauty about it, not least those huge floodlights at Aberavon RFC. Just beyond Port Talbot you are crossing the bridge and leaving the motorway to take the road past the Bay Studios into Abertawe, where of course, ambition is indeed critical. I found a car park by accident, it was at the back of the Boss Brewery. I popped in for a pint and asked if it was ok to leave my car. The answer was a positive one and it turned out to be a great move as I was straight out afterwards with no problems at all. Outside the ground the atmosphere was raucous but good natured. Stoke had taken over the Harvester pub that backs onto the stadium concourse and were regaling us with songs about ten German bombers being downed by the RAF from Stafford. Swansea’s support were gathered outside Frankie & Benny’s next door, but not a hint of bother. Had it mattered, I’m not so sure the atmosphere would have been quite so cordial. The ground needs very little in terms of description other than it holds 20,000 and is in the typical bowl shape that we see at Leicester for example, albeit slightly smaller. I chose to sit behind the South goal where the view was very good. The atmosphere was at the other end of the ground though, where the Stoke fans were magnificent, and a clutch of Swans sat adjacent in the East stand were doing their best to reciprocate. It was a strange atmosphere to be fair. The Stoke fans were having a party combined with a bit of gallows humour, while the Swans fans had the gallows humour, but the atmosphere was very flat at times, while also bordering on toxic given the vitriol aimed at Chairman Huw Jenkins and the clubs American owners. 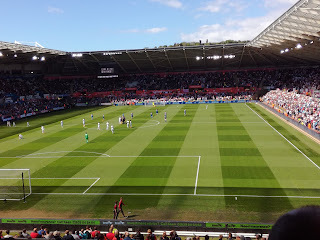 As for the game, Swansea took the lead in the fourteenth minute through Andy King, but by half time Stoke had turned it on its head thanks to goals from Badou Ndiaye and Peter Crouch. Shaqiri managed to miss a penalty early in the second half, but despite Swans having plenty of the ball in the final third of the pitch, they had no one who seemed capable of putting the ball in the net. Premier League Football - But When May We See It Again? The clubs PA announcer asked that no one went on the pitch at the final whistle, and when Anthony Taylor ended the game quite abruptly with no added time, it was kind of strange and muted. 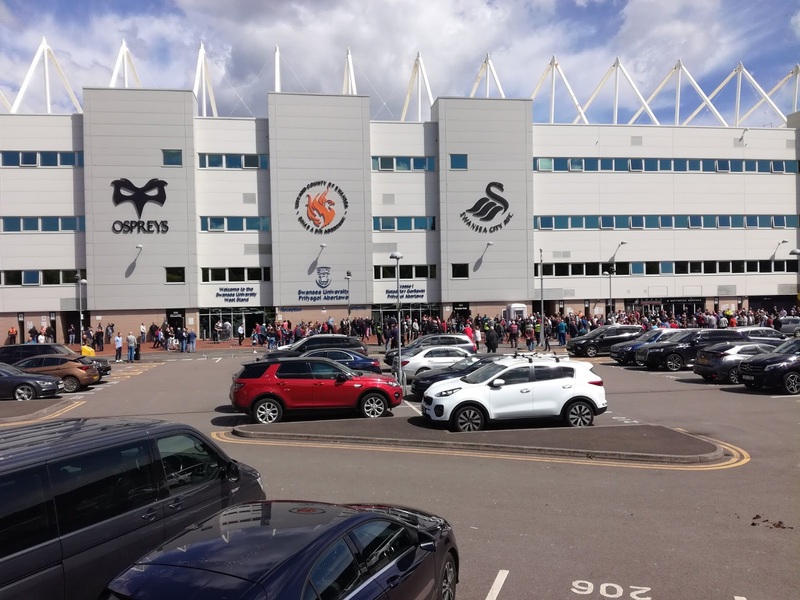 No one went on the pitch, Tammy Abraham applauded the Swans fans (he’ll be loaned out in the Premier League next season – the new Patrick Bamford), and the crowd filed away. The Stoke fans sang ‘Delilah’ while everyone else went home. As I drove out of Swansea, the commentary team on BBC Radio Wales had mixed views. Grateful and honoured to have been part of the last seven years and the success that has brought, but at the same time, deeply concerned about the direction the club is going in, especially in terms of the current ownership. Only one meaningful version of ‘Hymns & Arias’ was sung all afternoon, and I think that says it all, but you know what? I joined in!